These JHM Oil Change Kits come with everything you need to change the oil in your B6-A4 1.8T. You save money too! What's included? 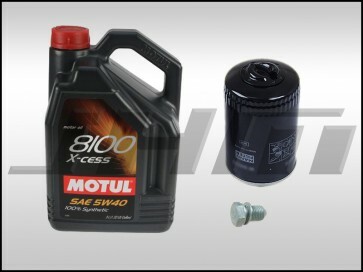 1x 5 - Liter Jug of 5w40 Motul X-cess 8100 Synthetic Oil, 1x - High Capacity MANN Oil Filter (pictured and longer than stock), and 1x OEM oil drain plug and O-ring. The B6-A4 1.8T takes 4.2 quarts (4 liters) of oil with a stock filter. With this high-capacity filter that is recommended by Audi, it will take a bit more. This 5L jug is perfect because you'll get enough to fill up to capacity and also have a little left over just in case of spillage or emergency top-offs.